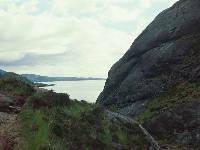 Midway through the Spring 1980 motoring holiday with my walking companion Graham (other bits of which are chronicled elsewhere on this site), we've crossed the Mam Ratagan pass from Kintail and taken the tiny private car ferry across Kyle Rhea from Glenelg to Skye. 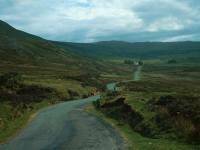 On the Skye side a narrow, winding, single track road winds across empty moorland towards Broadford. 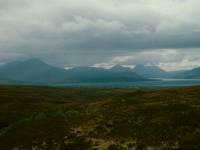 Broadford Bay and the Red Cuillin are seen here from Glen Arroch. 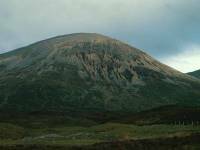 Beinn na Caillich (the "Peak of the Old Woman") from the same spot. After a brief stop at Broadford we've turned left onto another lonely road, the one from Broadford to Elgol that runs hard by the southern slopes of the Red Cuillin. 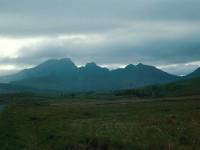 Bla-Bheinn, or Blaven (3045ft, translation obscure) is one of Scotland's most dramatic sights. 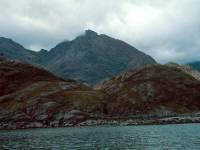 It sits at the base of the Strathaird peninsula between the inlets of Loch Slapin and Loch Scavaig and, although it sits beside the Red Cuillin, it has far more in common with the Black Cuillin and is a tricky climb. It's part of the Highland estate that was recently owned by rock musician Ian Anderson, of Jethro Tull. From the same point, Beinn Dearg Mhor (the Big Red Mountain, 2325ft). 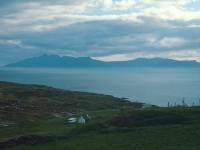 We've arrived at Elgol, a lonely, scattered community on the eastern shores of Loch Scavaig, from where we look across to the Island of Rhum. 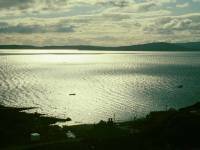 From the same spot, we look across the rocky foreground, Loch Scavaig and the Sound of Soay towards the craggy island of Eigg. 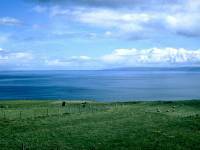 The island of Soay, virtually uninhabited. And this is the reward you get for living in such an out of the way place. 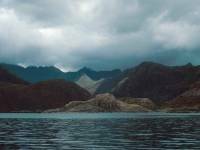 The inhabitants of Elgol live with this dramatic view of the Black Cuillin, seen across Loch Scavaig. We found a bed-and-breakfast place in Elgol but there was nowhere to eat, so we had to drive the 17 miles back to Broadford for an evening meal then the 17 miles out to Elgol again. 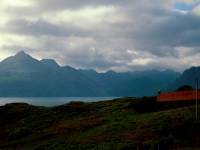 The village of Elgol itself, seen the following morning. 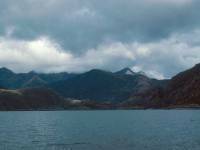 The reason for our excursion to Elgol was to get a boat trip across Loch Scavaig to the environs of the Black Cuillin. 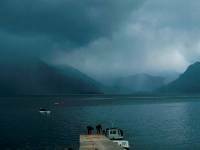 We were waiting for the boat to depart but Skye's traditional weather intervened and we dashed back to the car to sit out the storm. 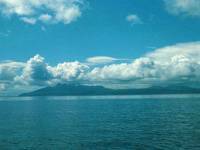 Twenty minutes later, we saw this glorious view of Rhum across the sound of Soay. And now a small group of intrepid explorers, Graham and myself among them, are on board the tiny passenger boat that plies Loch Scavaig. 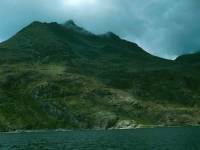 We are approaching the Black Cuillin, Scotland's most dramatic mountain range. Sgurr na Stri ("peak of conflict") looms to the right. 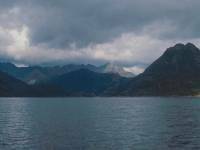 Drawing nearer to the Cuillin range. That's Gars-bheinn, or Garven, (2935 ft, translation obscure). It's the first summit in the traverse of the Black Cuillin Ridge, an expedition for experienced rock climbers and way beyond the capabilities of ordinary walkers like me. 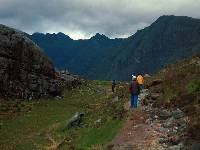 A traverse of the ridge involves 10,000ft of ascent and a great deal of exposure to vertical drops. Some climbers aspire to complete the traverse in a day. 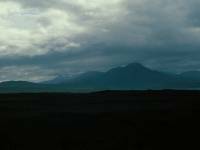 The Black Cuillin loom closer. 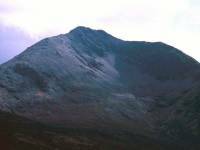 Sgurr nan Eag, (3031ft), the first Munro of the Cuillin ridge. 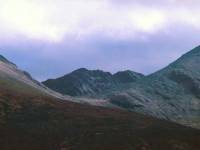 "Sgurr" is "peak", while "eag" means "notch, tooth, or serration". 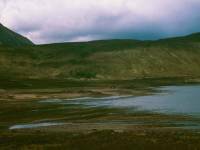 It's not seen here but the Coruisk River, which flows through this little ravine, is the shortest river in Britain at about 350 metres. 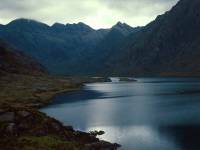 Loch Coruisk, set within the heart of the Black Cuillin, and one of the wildest places in Britain. This is a sight few people see. 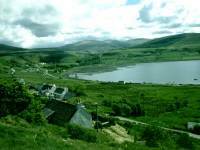 Note the tents pitched to the left of the loch. What lucky people to have this to themselves. Having returned from the boat trip we've given two schoolteachers a lift to Broadford and have now parked up on a lonely back road near Loch Ainort to have a late (about 3.30pm) lunch. 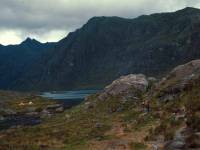 From our lunch stop we can loom up into the Coire nan Bruadaran to see Blaven looming across the col. The neighbouring peak of Marsco ("seagull rock", 2414ft). 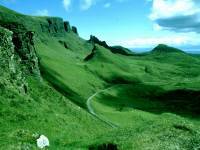 This is Trotternish, the northernmost part of the Isle of Skye. 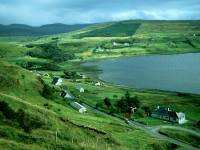 We're travelling along the east coast road north of Portree and the Storr, en route for Staffin. 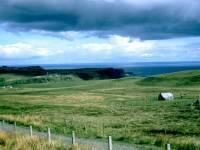 The wild Trotternish coast near Valtos. 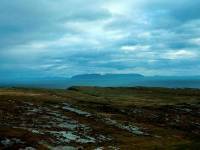 Rubha Reidh seen from Trotternish, just south of Staffin. 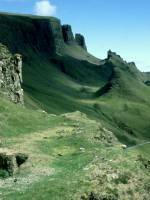 Just north of Staffin is the weirdest rock formation in Britain - the Quiraing, formed like the Storr of a basalt landslip. 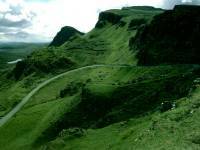 The high road across Trotternish to Staffin winds up through the rock formations south of Quiraing. 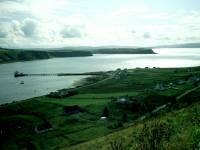 The village of Uig, on the west side of Trotternish. 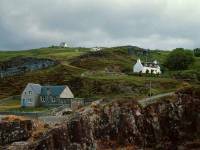 Uig is the end of the longest bus route in Britain (Glasgow - Fort William - Kyle - Portree - Uig) and is the point from where ferries depart to the Outer Hebrides. 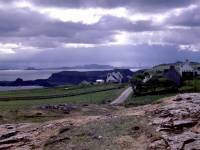 Another view of Uig, from the high road to Staffin. 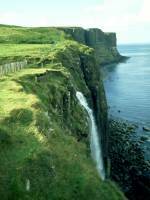 Kilt Rock, on the east Trotternish coast near Elishader. 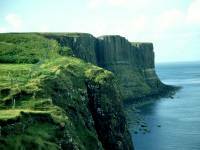 The cliff is formed of basalt columns. The Meallt Falls, south of Kilt Rock. 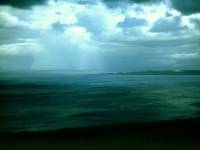 The coast of Trotternish near Valtos, looking more like an oil painting than a photograph.